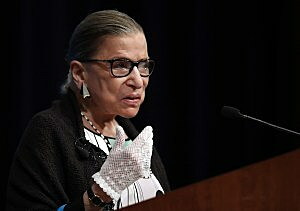 WASHINGTON (CN) – A spokeswoman for the Supreme Court indicated Sunday that Justice Ruth Bader Ginsburg has returned to work from the New York hospital where she had cancerous growths removed from her lungs. Though she did not indicate when the 85-year-old stalwart will return home from the Memorial Sloan Kettering Cancer Center, Supreme Court spokeswoman Kathleen Arberg described Ginsburg as up and working. Ginsburg underwent surgery on Friday after doctors found two malignant nodules while treating her for broken ribs in November. Ginsburg suffered the fracture after taking the tumble in her office, but did not let her recovery affect her work. Indeed the justice is said to have never missed a day of oral arguments in her 25 years with the court. As well wishes, prayers and other bipartisan messages of support for the iconic justice poured in Friday, one comment from Bill O’Reilly drew much ire on social media. “Justice Ginsburg is very ill. Another Justice appointment inevitable and soon. Bad news for the left,” O’Reilly tweeted shortly after the court announced Ginsburg underwent the pulmonary lobectomy. Meghan McCain, daughter of late Arizona Republican Senator John McCain who died of brain cancer in August, quickly slammed the disgraced former Fox pundit for politicizing Ginsburg’s state of health. Following surgery and a full body scan, doctors found “no evidence of any remaining disease” and have not planned any further course of treatment. Friday marked the third time Ginsburg was treated for cancer: she was diagnosed with colorectal cancer in 1999 and pancreatic cancer in 2009. O’Reilly did not immediately return request for comment Monday. The former journalist lost his popular cable-news program this past April after reports emerged about the numerous sexual-harassment lawsuits he settled with women at Fox over the years. Despite widespread criticism, the White House never condemned Sadler’s remarks. It was reported that her ouster followed reports she had told President Donald Trump that Mercedes Schlapp, the White House strategic communications director, had been leaking to the press.